Scientists from the Marine Biological Laboratory (MBL) and the Woods Hole Oceanographic Institution (WHOI) were recently awarded a $1.2 million collaborative grant from the National Science Foundation (NSF) for studies on the role of sulfur-oxidizing bacteria in salt marsh nitrogen and carbon cycling. The fieldwork will be conducted at the Plum Island Ecosystem Long-Term Ecological Research (LTER) site on the North Shore of Boston. Salt marshes are among the most biologically productive habitats on Earth, and they also are heavily influenced by human activities. Excess nitrate from land runoff can degrade water quality and lead to harmful algal blooms and low oxygen zones harmful to fish. Microbes in salt marsh ecosystems play an important role in cleansing marshes of this nitrate runoff, often transforming nitrate in the water to harmless nitrogen gas that is released to the atmosphere – a process called denitrification. But that is not always the fate of nitrate – for reasons not yet completely understood, in some cases microbes use different processes, for example converting nitrate to ammonium, which then remains trapped in the ecosystem. What determines nitrate’s fate? 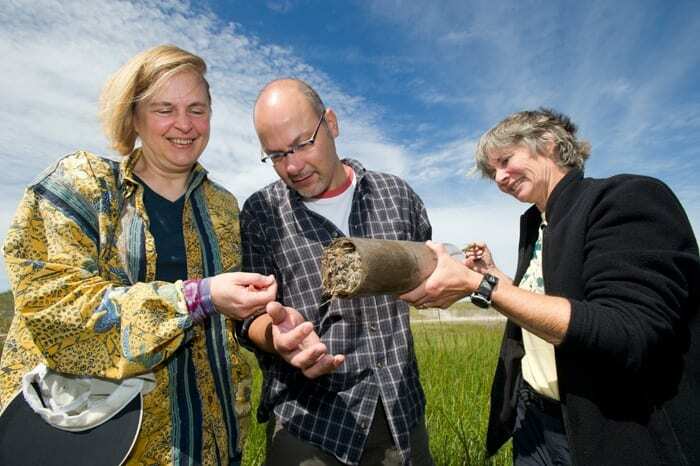 Recent research suggests that one key may be the forms of sulfur and carbon compounds available in marsh sediments, which, in turn, affect types of microbes living in the marsh and their activities. Ultimately Stefan Sievert (WHOI) and Zoe Cardon and Anne Giblin (MBL) hope to better understand the environmental conditions and microbial activities that determine the fate of nitrate in salt marshes, either cleansing the marsh of nitrate via denitrification, or retaining that nitrate nitrogen in the marsh by transforming it to ammonium, a process called dissimilatory reduction of nitrate to ammonium or DNRA for short. In addition to the summer fieldwork at the Plum Island Estuary, the project will involve maintaining sediment cores (including rooted plants) at controlled seawater levels in the MBL Research Greenhouse. At WHOI, Sievert and his team will perform microbial community analyses in field sediments and the greenhouse cores, using a variety of molecular tools; at MBL, Giblin, Cardon, and their team will measure microbially-controlled rates of nitrogen and sulfur transformations in sediments, coordinating with Sievert to decipher which types of microbes and processes are dominant under different environmental conditions, and why. This research is scheduled to continue until the end of 2014. The Plum Island Ecosystems long-term ecological research (PIE LTER) was established in 1998 and is led by The Ecosystems Center at the Woods Hole-based Marine Biological Laboratory (MBL). During the course of research, scientists have designed and implemented a comprehensive study of a major, land-estuarine system in the Acadian biogeographic province in eastern New England. Their goal is to develop a predictive understanding of the long-term dynamics of watershed and estuarine ecosystems at the land-sea interface and to apply this knowledge to the wise management and development of policy to protect the natural resources of the coastal zone. The principal study site is the Plum Island Sound estuary, its coupled Parker and Ipswich River basins and the coastal ocean, the Gulf of Maine. The Marine Biological Laboratory (MBL) is dedicated to scientific discovery and improving the human condition through research and education in biology, biomedicine, and environmental science. Founded in 1888 in Woods Hole, Massachusetts, the MBL is an independent, nonprofit corporation.